April 11, 2019 Sekiro: Shadows Die Twice has already sold two million copies, far out-selling its FromSoft predecessors. FromSoftware’s latest outing, Sekiro: Shadows Die Twice has taken just ten days to sell more than two million copies. In an investor report published earlier today, publisher Activision-Blizzard announced that the game had reached the milestone. 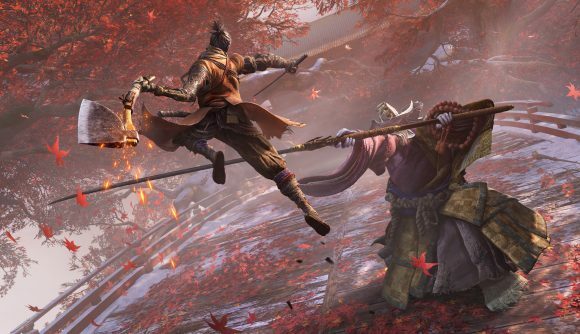 Sekiro got off to a flying start on launch day, selling more than 100,000 copies in its first 24 hours. A concurrent player count of 125,000 players made it the biggest Steam launch of 2019 so far – and the third-biggest launch of a Japanese game on the platform – beating Devil May Cry 5’s sales by a comfortable margin. Those sales figures suggest that Sekiro is on track to become the highest-selling FromSoft game ever. According to industry analyst Daniel Ahmad, the first Dark Souls game sold 2.37 million copies in 18 months, while Dark Souls 2 sold 2.5 million in about a year. Dark Souls 3 is likely to be Sekiro’s closest competition, but even that only managed three million copies in about three months. Those Steam figures all come from SteamCharts (via Spiel Times). It’s also worth noting that Sekiro: Shadows Die Twice has become the third most-popular Japanese launch ever on Steam. Sekiro has also made a decent splash elsewhere. On launch day, it was the most-watched game on Twitch, with 631 million (or about 1200 years) over launch weekend. That figure has jumped to more than 1.1 billion minutes by the end of its first week. It’s also worth keeping in mind that Sekiro has no piracy protection, and was reportedly cracked a day before release. Nevertheless, this does not appear to have affected its sales, or player enjoyment. We’re currently loving the game, although our reviewer needs a bit more punishment before he decides on a final score.